AN ORDINANCE RELATING TO GOVERNMENTAL OPERATION; ESTABLISHING A REQUIREMENT OF LICENSING OF BUSINESSES CARRYING FORTH CERTAIN ACTIVITIES WITHIN THE CORPORATE LIMITS; AUTHORIZING PENALTIES AND FEES; PROVIDING PROCEDURES; ADDING A NEW CHAPTER TO TITLE 4 OF THE MUNICIPAL CODE; & PROVIDING AN EFFECTIVE DATE. 1. Historically, the City has not exercised the authority to require businesses, whether located within the corporate limits or doing business within the corporate limits to a defined extent, to obtain licenses from the City. 2. Based upon a review by the Council and Mayor, it has been determined the public would benefit by such a licensing program. SECTION I: Purpose. It is found to be in the public interest that the city shall be at all times informed as to the individuals, partnerships, corporations, or business entities of any form whatsoever which are operating from places of business within the corporate limits of the city. 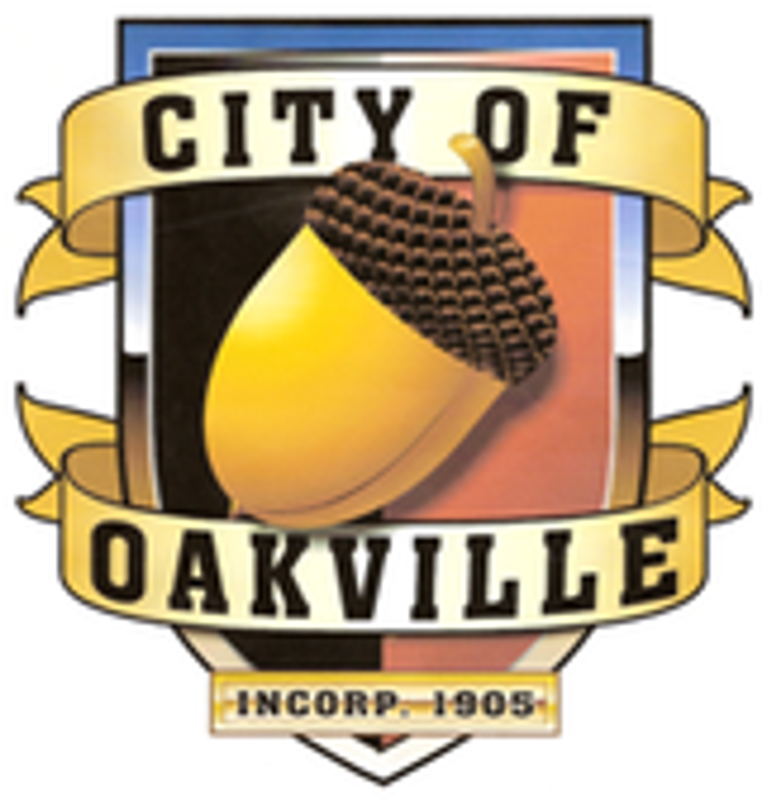 It is declared that it is the purpose and intent of this chapter to require all businesses, of whatsoever type, that maintain places of business within the Oakville corporate limits to, at all times they so operate, obtain from the clerk-treasurer and be in possession of the business license established by Section III. (2) The provision of a service to clients, customers or patients in exchange for compensation. It is the intent of this definition that it includes within its meaning, but is not limited to, all businesses required to pay that certain tax levied by the state of Washington pursuant to RCW Chapter 82.04. Each such store, place, or office shall be considered a separate place even though more than one such store, place, or office is owned by the same person, partnership, firm, or entity. SECTION III: Registration--Due date--Evidence of intent to enter into business. 3.1. Any business as defined in Section II shall register with the city clerk-treasurer within sixty days of the effective date of the ordinance codified in this chapter. The registration shall be in such forms as may be established and/or determined and provided by the clerk-treasurer. So long as the business continues to transact business, it shall maintain a valid certificate as provided in Section IV. 3.2. Any business established after the effective date of the ordinance codified in this chapter shall register within thirty days of the establishment of the business. (3) To commence advertising announcing the opening or establishment of a business. 3.4. A business licensee shall not be issued for any activity that is known to violate local, state, or federal law. Issuance of a business licensee shall not relieve the applicant or licensee from the duty to comply with all applicable city, state, or federal laws, rules, and regulations. SECTION IV: Registration certificate--Fee--Application date--Renewal. 4.1. The fees for issuance of the registration certificate established by Section III, renewal thereof, and any penalty fees shall be such amounts as may be established by written resolution of the Council. 4.2. The fee shall accompany the application, whether it is an initial application or an annual renewal application. The certificate shall be valid for the calendar year in which it is issued and shall be renewed each calendar year. Renewal applications shall be made prior to the end of the calendar year for which the current certificate is issued: provided that in the event the business will cease operations not later than January 5th of the following year, no such application for renewal need be made. 4.3. In the event that the clerk-treasurer denies the issuance of a license, whether upon the basis the indicated business activity is unlawful or contrary to any applicable provision of law or Municipal Code, notification of such denial shall be provided to the applicant in the manner provided by Section X of this Ordinance. The applicant shall have the right to appeal such denial in the manner and under the provisions of Sections X and XII of this ordinance. SECTION V: Registration certificate--Issuance-Term. Upon receipt and processing of an initial or renewal application, the clerk-treasurer shall issue a certificate of registration in such form as he or she determines appropriate, which shall be posted in a conspicuous place in the place of business of the registrant. It shall be displayed upon request to the city clerk-treasurer or his or her designee. As provided in Section IV, the certificate shall be valid for the calendar year designated thereon and is nontransferable. SECTION VI: Tax-exempt or nonprofit status. 6.1. The provisions of the sections of this chapter shall be not apply to any charitable, religious, or nonprofit organization or corporation which either has received tax-exempt status under the Internal Revenue Code Section 501C(3), 26 U.S.C. 50lC(3), as adopted or as hereafter amended; or is organized as a non-profit corporation or association under the laws of the state and is properly so registered with the state. 6.2. Any person or organization claiming an exemption as stated by subsection 6.1 of this section shall file with the clerk-treasurer of the city a copy of either the tax exemption granted by the Internal Revenue Service under the provisions of Section 501C(3) or proof from the appropriate registering agent of its nonprofit status. The clerk-treasurer shall maintain a list of all organizations who have such an exemption and such list shall be kept available for public inspection. In the event the clerk-treasurer finds the claim is improper, notice shall be given to the applicant, who shall have a right to appeal the denial to the city council in a manner established by Section X. To the extent allowed by law, the decision of the city council at such hearing shall be final. Any appeal from the decision shall be taken as provided by Section 12.2 of this ordinance. SECTION VII: Penalty for violation. It is unlawful to operate any business as defined in Section II within the corporate limits of the city of Oakville except while in compliance with this chapter. Such violation shall be deemed a civil infraction and processed in the manner provided by RCW Chapter 7.80, as now existing or hereafter amended or succeeded, said chapter being adopted by this reference. Upon a finding of committed of a violation of this chapter, punishment shall be imposed pursuant to the terms of said RCW Chapter 7.80. SECTION VIII: Suspension of Licenses: Authority. The clerk-treasurer may suspend any license issued by the city pursuant to an application for any activity which constitutes a ground for revocation of this license pursuant to Section II. This suspension shall be for a period of thirty days for the first violation and sixty days for a second violation within a two-year period immediately proceeding the event for which the action is taken. During the period of suspension, the licensee shall not undertake any activities within the corporate limits of the city which would require the possession of the license suspended. (d) The action to suspend the license would result in more than two suspensions for violations of this chapter within the two-year period immediately preceding the event for which the action is taken. SECTION X: Notice of suspension or revocation. 10.1. In the event the clerk-treasurer determines there is cause for suspending or revoking any license issued by the city pursuant to the grounds specified in Section IX, the person holding the license shall be notified of the intended suspension or revocation either by personal service or by written notice delivered by certified mail, return receipt requested, and 1st class mail, United State Postal Service. Notice mailed to the last business address on file with the city shall constitute sufficient notice and service. The notice shall specify the grounds for the suspension or revocation and the term of the suspension or revocation and shall further notify the licensee of the right to appeal the suspension or revocation and the procedure to be utilized therefore. The inclusion of a copy of this section shall be deemed a satisfactory explanation of the procedure of appeal. 10.2. The notice of revocation or suspension shall become effective ten days from the date of the first attempt of the United States Postal Service to deliver the notice to the address specified in subsection A of this section or, in the case of personal service, ten days from the date of service; provided, that in the event the licensee files a written request for a hearing with the city council within such period, the suspension or revocation shall be stayed until the hearing on appeal shall have occurred. The notice shall be deemed served upon the council by serving it upon the office of the clerk-treasurer. In the event the licensee does not file such a request within the aforementioned period, the license of the licensee shall be suspended or revoked as provided in the notice served upon the licensee. (d) Such other factors as may be deemed necessary and appropriate. Upon determination of the civil penalty to be imposed, the clerk-treasurer shall give notice to the licensee in the manner provided by Section X in relation to suspension and revocation of license. Any person aggrieved by the amount of the penalty established by the clerk-treasurer may request a hearing before the city council from such establishment by filing a written notice of request for hearing in the same manner provided for a hearing or appeal from the notice of suspension or revocation. (a) At a hearing before the council held in relation to a request made pursuant to provisions of this ordinance, the appellant shall be entitled to be heard and to introduce evidence in its behalf. The clerk-treasurer or the clerk-treasurer's designee shall present such evidence in support of the action as may be deemed necessary and appropriate. The council thereupon shall issue its decision in writing which may affirm, reverse, or modify the decision of the clerk-treasurer. The licensee shall be notified by mail of the decision of the council. The decision of the council shall be final in relation to the imposition of any monetary civil penalty. (b) Upon request of the appellant, the clerk-treasurer or in the Mayor’s sole discretion, the mayor may, by subpoena, require the attendance at such hearing of any person and may also require any person to produce any pertinent book or record. Any person served with such a subpoena shall appear at the time and place therein stated and produce the books and records required, if any. The person shall further testify truthfully under oath administered by the clerk-treasurer as to any matter required of the person in relation to the matter before the council. It shall be unlawful for any person to fail to appear pursuant to such a subpoena issued by the mayor and it shall further be unlawful for any such person to fail or refuse to produce the required books and records or to testify truthfully under oath. 12.2. Right to Appeal Decision: The decision of the council in relation to the suspension or revocation of any license may be appealed to the superior court of the state of Washington in and for the county of Grays Harbor so long as such appeal is filed with the court within ten days of the issuance of the written decision. Upon appeal, the decision of the council shall be affirmed unless it is determined by the court that the decision of the council was arbitrary and capricious. Notwithstanding the existence, availability, or use of any other remedy, the clerk-treasurer or the Council may seek legal or equitable relief to enjoin any acts or practices with the licensee which constitute or will constitute a violation of any provision of any license, ordinances, or other regulations or statutes relating to the operation of such licensee's business. 14.1: Sections I through XIII of this Ordinance shall constitute a new chapter in Title 4 of the Municipal Code. If any section, subsection, sentence, clause, or phrase of this Ordinance is for any reason held to be invalid or unconstitutional, such decision shall not affect the validity of the remaining portions of this Ordinance. The Council hereby declares that it would have passed this Ordinance and each section, subsection, sentence, clause, and phrase thereof, irrespective of the fact that any one or more sections, subsections, sentences, clauses, or phrases had been declared invalid or unconstitutional, and if for any reason this Ordinance should be declared invalid or unconstitutional, then the original ordinance or ordinances shall be in full force and effect. 16.1. In recognition of the appropriateness of providing a transition period, any lawful business subject to the provisions of this ordinance which maintains a premises within the corporate limits of the City as of the effective date of this ordinance shall, upon submission of an application therefore, be issued a license or certificate without cost which shall be valid for the remainder of 2012. 16.2. This Ordinance shall take effect upon the fifth day following date of publication. PASSED THIS 13th DAY OF August, 2012, by the City Council of the City of Oakville and signed in approval therewith this 13th day of August, 2012.